When our children are struggling, it can be a very scary and concerning time. The good news is, you don’t have to go it alone. At the Family Guidance & Therapy Center, we understand just how important your child is to you and we take special care to earn your trust. We also know that the ability to form a close and connected relationship with your child is one of the best ways that we can help your child grow. We specialize in therapy for children and teens and can offer many solutions to help your child and your family. Children are a bit different than adults and symptoms of mental health disorders can easily be overlooked. Children often don’t know to ask to see a therapist, but when daily life becomes more and more challenging for both you and your child, it might be time to call for help. *Of course all children have bad days and the presences of any one symptom is not likely to be cause for alarm. Moving to a new neighborhood, school etc. We know you want the very best for your child. You hurt when they hurt. 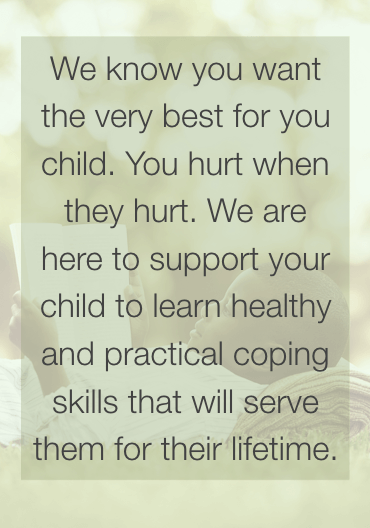 We are here to support your child to learn healthy and practical coping skills that will serve them for their lifetime.